The combination of Dynamics 365, PowerApps and Microsoft Flow makes it possible (and easy) to automate a variety of processes and workflows without using a line of code. This is an amazing new tool and here is the latest information about it. Microsoft Flow and PowerApps were both made available last year with the goal to empower people and businesses to create custom solutions without having to go through lengthy software development processes. Microsoft Flow can connect with 131 different applications and services, across which the user can establish multi-step flows that will trigger specific actions based on pre-set conditions. 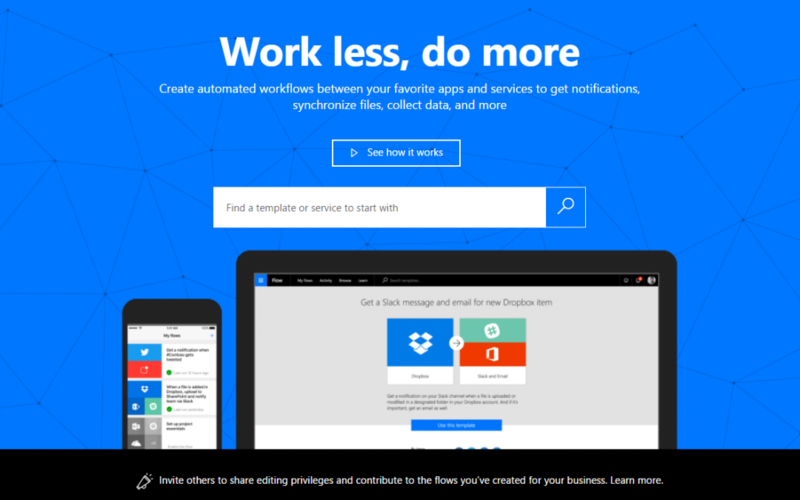 Microsoft Flow is free to use and comes with many pre-set workflow templates. It also gives you the option to collaborate with your team so they can contribute to the workflows you have created. The Microsoft Flow announcement post on the Microsoft blog will provide you with a more thorough description of the tool’s capabilities, and links to guides that will help you to get started with it. PowerApps uses your existing Cloud solutions and data sources to enable you to build Apps quickly and without writing code. Those Apps can be easily shared and used on a variety of devices – they can also be replaced quickly as your business processes evolve. If you’re interested in learning more about it, we recommend reading Announcing Public Preview for PowerApps on the Microsoft blog for useful links and tips on how to get started. Microsoft Flow is great for collecting data, getting the right notifications at the right time and synchronising files between apps. PowerApps capabilities, understand the difference between Microsoft Flow and LogicApps. How Microsoft Dynamics 365, PowerApps and Microsoft Flow come together. To get regular Dynamics 365 updates, news and tips, please subscribe to the 365 Talent Portal YouTube channel. Several longer video guides and demos are available on Microsoft’s YouTube channels – here are a few we recommend.